Ha! Hey now, come to MN (during the 4 months of unfrozen water) and I'll show you the goods! poop! I didn't realize you'd taken off (Brianp). I was looking forward to hitting some rivers with you this season. :( best of luck anyway. I'm brand new and looking to get on a river for the first time. I took the beginner course at Kayak Academy last week and I'm signed up for the beginner class at NWOC starting mid April. I also went to a pool session this weekend. . I bought a Jackson Zen 75 and all my gear this weekend. I'm up in Everett and looking to go this Sunday 3/24. I am in mill creek and have yet to start. 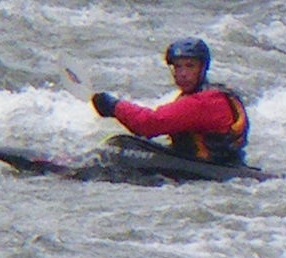 I have taken several on river courses and roll clinics. Just need to go out solo. Waiting for a little warmer. Last course I went down to CA and spent 3 days with instructor. Also bought a zen. only runs in the winter. about getting one as this make cold weather paddling totally comfortable. above Skykomish to the bridge just above money creek. In looking to go soon too. Just need my dry suit and I'm good. And some more work on my roll. Tr182md and stretch76 I'm in. I'm up in bham but will come down south. Instead of solo I would try and get a couple paddlers with some ww experience to go with. They're usually a big help . Good for you guys, Stretch76 I think the NWOC beginner class is awesome, that is the one I took a long time ago. I know I always say this on here and I'm not saying you won't find runs and people to go with on this site, you probably will, but another really good place to try is Washington Kayak Club, they have more structured beginner-level trips, pool classes, etc. They have a ww class that's already started but when they graduate next month that will be another bunch of people looking to get out on rivers, plus the instructor set and a bunch of experienced members who also do trips on Class II and III throughout the year. And if we end up putting together a beginner-ish run I will post back on here. I bought a drysuit from Kayak Academy on Saturday. I was hoping to find some experienced paddlers that would be willing to take a beginner. Fastpaddler let me know if you get a drysuit. We could try Skagit. That would be the closest to both of us. I'm only looking to do class I or II for now. If I have to I'll spend some more time in the lake working on my roll. I have read about the WKC trips and I'll probably get in on some of those but I want to use the new boat. Not sure about Sunday but at some point can car pool if we have a north group. I can hold 3 kayaks, maybe more for river. I have setup for 3 sea kayaks. I have drysuit and some safety gear. I was a river guide for a long time in CA. Still do it occasionally. Been slow on the kayak thing but time to get started. Yeah I should have a dry suit by 1st week of April. Class 2 - (3-) for me. Ps there's the Sauk too! Hi, I am new to P.P. as well. I live in Canada, so I do most of my paddling up there. Would be great to have a group of paddlers to connect with when I venture south of the line. Thanks for starting this post! It is a huge help. I am a class II-III paddler who is always looking for challenges and ways to increase my skills. Where do you boat at up there? I took my intro course on cultus and the chilliwack With purple Hayes. That's the only river I that I know to get to. I live in Lynden, so it's not that far away. I'd be down to go somewhere up in ca sometime. I do prefer to have experience along, though?! I live in Chilliwack, so I paddle the Chilliwack alot. There are tons of options though, from Whistler to the Okanagan. For class II-III there is the Seymour, Capilano, Chilliwack, Chehalis, Coquihalla....the list goes on. The Thompson is alot of fun too, but that is a bit harder of a run in which its best to have a few good support boaters (I had a couple swims on the narly rapids). I have only been paddling for a year, so if we were to go it would be best to have at least 1 good support paddler along. That being said I know alot of those! There is a good paddling community up here on the vankayak.org forum. Usually there will be trips posted and organized, and most paddlers seem pretty keen to take beginner/intermediates on the easier runs like the Chilliwack Classic. You are welcome to join in anytime! I would join the forum up here so you can keep an eye on the trip posts. Its free to join. the IGA in Darrington at 10:30 and camping that evening. I am willing to also paddle on Friday and camp. You can join as day trip or camp out. there is no coverage where we will be camping. I highly recommend RPM Max's trip. One of the best rivers north of Seattle, and he is a great person to go with. He has been paddling longer than most people on this site. Once you've run the Sauk river you'll know what I mean. I will be staying at Washington Park in Anacortes for the weekend, but I would be willing to drive up Saturday morning to meet up at IGA in Darrington at 10:30. I would head back to Anacortes that night to spend time with the family though. What sections of the Sauk, Suiattle will you be paddling on Saturday? I would like to read through the writeups on this forum. About how long of a run would your group be doing on Saturday? Would just like to set a bit of a schedule and know roughly what time I would be back in Anacortes by so I can let me family know. A couple of friends and I are interested in learning some of the basics of white water kayaking. We are in the seattle/eastside area. Due to an acl surgery about a month ago I'm moving a lot slower this summer and therefore have promised to get my fiancee out on the water. She is completely new but has a pool roll. If other newbies would like to join us around the seattle area I'm happy to help and play safety. That said, there are only so many I can look after on my own so I'll post some trips but if we could talk some other experienced boaters into coming along as well we would all be better for it. Look for trips to start posting around the end of may when we get back from vacation. I'm looking to go out this Thursday on the Sky (split rock to big eddy) and would love some experienced company. If anyone is interested let me know, I am free all day and can meet up anytime. Thanks! I just posted a beginner trip for Sunday. Any beginners with 10+ runs to intermediates up for a run on the Skykomish soon? It should still be good from Thursday through the weekend? Either from Split Rock / Railroad Bridge to Big Eddy, or preferably from right below Boulder Drop to Big Eddy if you are up for it. The flow level is good for IK's since it's high enough to cover rocks in the slower/lower stretches, but not too high to be too pushy for lower skill levels. What a great forum!!! Perfect! I'm new to paddling... taken a couple classes from Kayak Academy, and now wanting to go practice. I'm planning to go hit Snoqualmie powerhouse area Saturday 11/9/13. If there are any other new people that would be happy to just go practice going in and out of eddies, it would be great to have company.